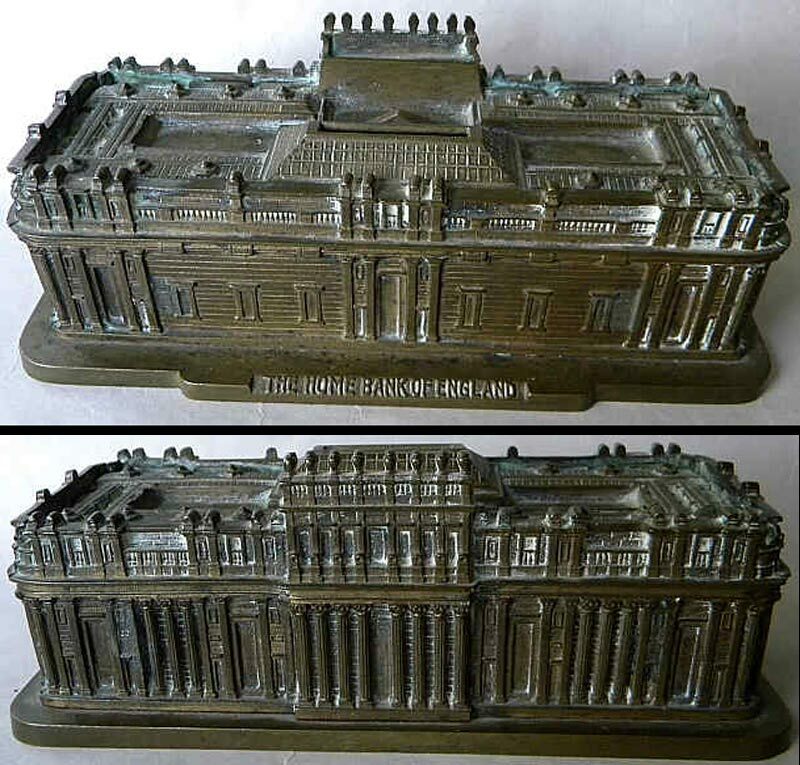 Another rare replica of this same bank is perhaps more recent (1920s?). This model of the bank is a coin bank. 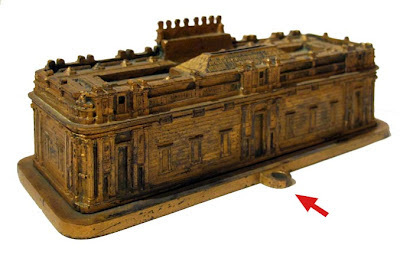 This replica represents just th building before the structure’s expansion to take up an entire city block. 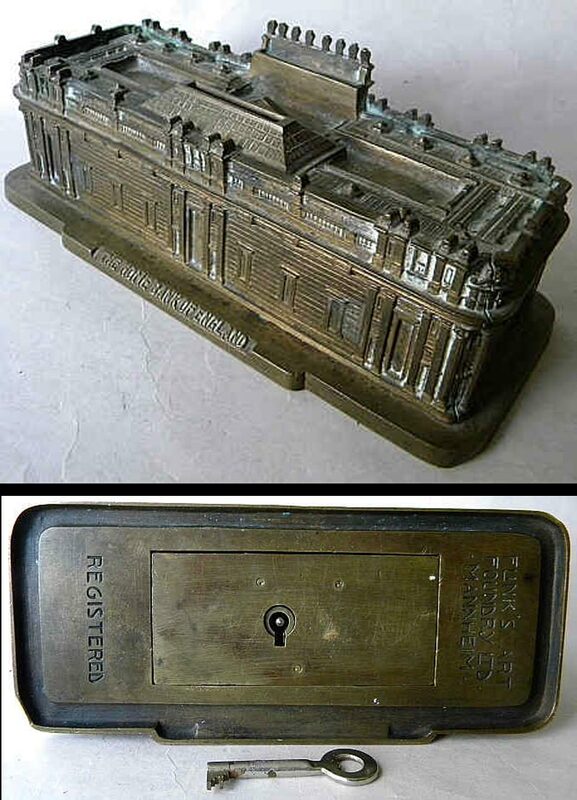 On the base are the words, “Home Bank of England.” This one appears to be a brass casting with the words underneath, "Funk's Art Foundry Ltd. Mannheim. Registered." David W. wrote about this version, “Mannheim, of course, is a German City. In this period, other English souvenir buildings, made in Germany, were imported to the UK; though I cannot think of examples marked in this way.” The dimensions of this Bank of England are 3 1/2" x 7 1/2" x 3" high. One sold recently on eBay for $1450. Interestingly, David W. has a slightly different version of this coin bank that includes a small ring on its base, which is not on the recently sold eBay version. Anyone have an idea what it could be? See photo below. 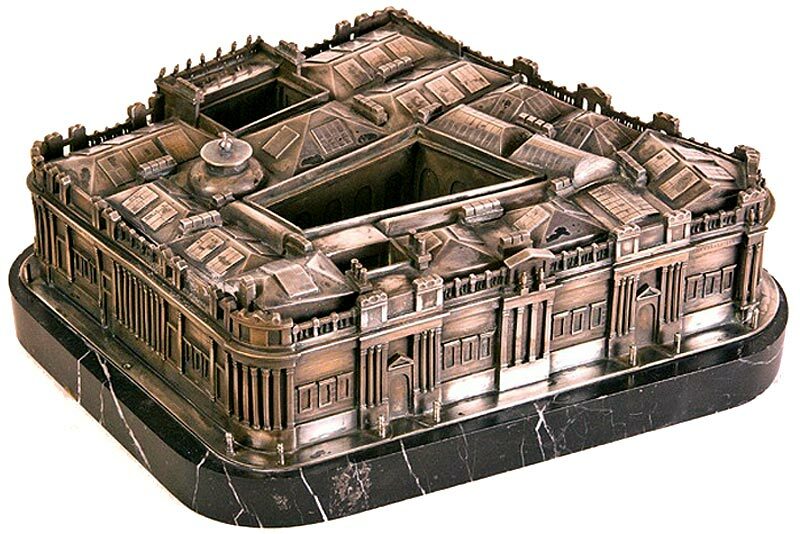 Yet a third miniature replica of this bank is a small ceramic coin bank version. 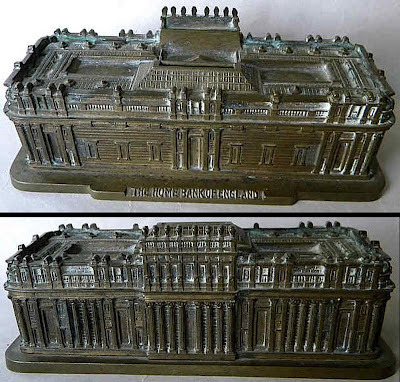 This souvenir building made by Szeiler Studio in England in the late 1960's. This replica is hand-painted glazed ceramic in a dark brown color. It stands 3.75" tall, by 4.5" wide and 3.5" deep. 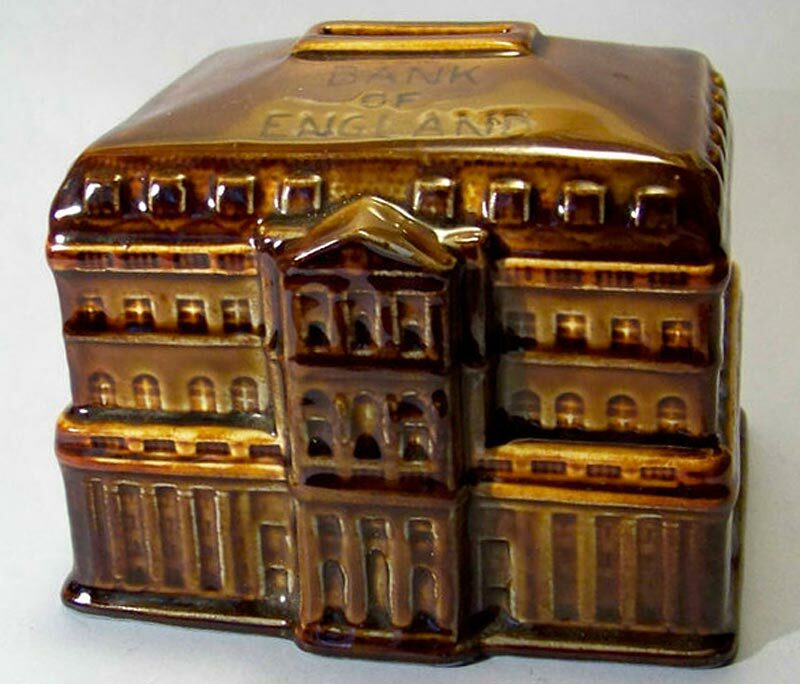 The money slot is on the top which reads "BANK OF ENGLAND", and the round trap on the underside. One of these sold for $40 on eBay recently. 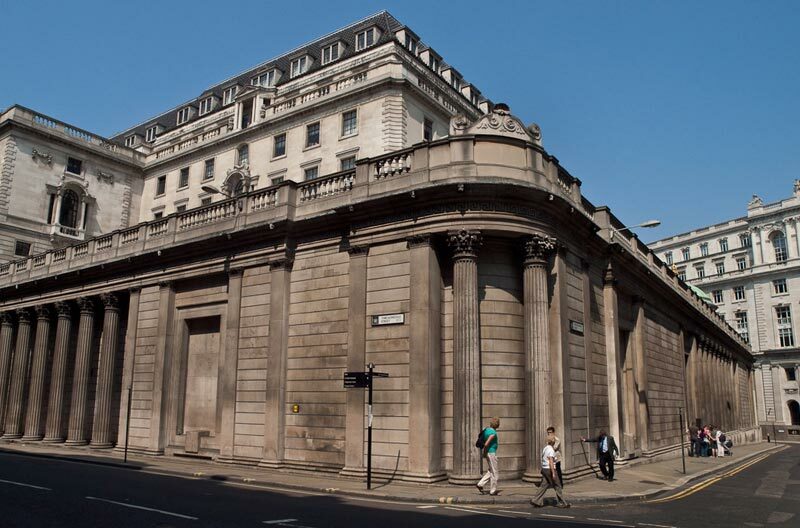 The Bank's headquarters has been located in London's main financial district, the City of London, on Threadneedle Street, since 1734. It is sometimes known by the metonym The Old Lady of Threadneedle Street or simply The Old Lady. The Bank of England moved to its current location on Threadneedle Street, and thereafter slowly acquired neighboring land to create the edifice seen today (an entire block). Sir Herbert Baker's rebuilding of the Bank of England, demolishing most of Sir John Soane's earlier building was described by architectural historian Nikolaus Pevsner as "the greatest architectural crime, in the City of London, of the twentieth century." 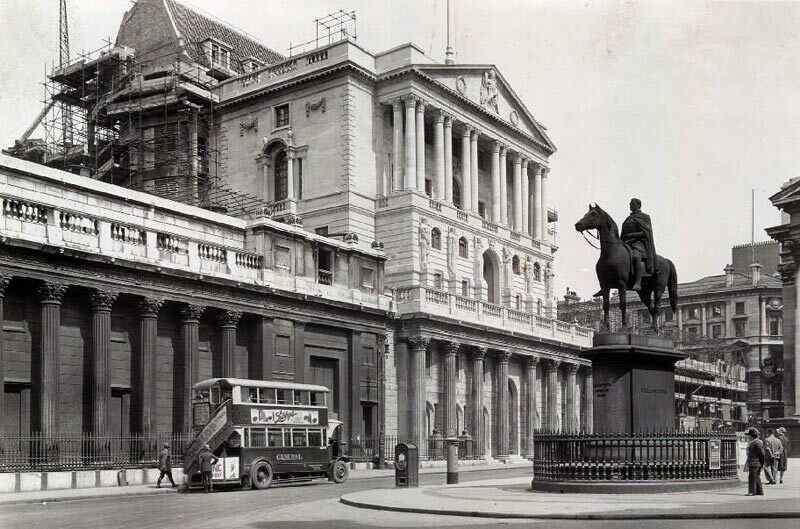 The structure of 'Soane's Bank of England' remained more or less untouched until it was demolished and a new building erected by the architect Herbert Baker between the two World Wars. I had 2 European banks, brass or bronze (one 1910 the other 1920's) with an eyelit ring protruding from the base. The seller of the "ringed" Dutch bank stated that it was a donation box and was by means of a screw affixed to the countertop to deter theft of the monies inside. Screw taken out, bottom trap opened and donations removed. Hi SP, Thanks for your comment. That very well could be the reason for this eyelit on the bank's base.